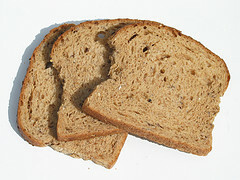 We are all familiar with the term “Brown Bread” [^] and I don’t mean Hovis either, but this is a little extreme! Ami Kealoha at CoolHunting [^] has a story about a Thai artist, Kittiwat Unarrom, who makes life-like body parts out of bread in the family bakery! Apparently despite the gruesome nature of the product, it still sells well and tastes just like the real thing – bread that is. Photo Credit:Flickr User – how can I recycle this [^].